FRANKFURT/SEOUL (Reuters) - Audi's first electric sport utility vehicle (SUV) will hit showrooms four weeks later than planned because of a software development issue, a spokesman for the German luxury car brand said on Sunday. 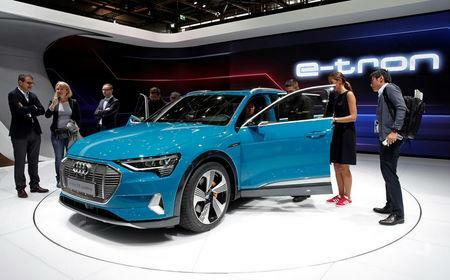 The spokesman said Audi's e-tron midsize SUV faced delay because the carmaker needs new regulatory clearance for a piece of software that was modified during the development process. The e-tron delays were first reported by German newspaper Bild am Sonntag, citing sources close to the company. The paper said delivery could be delayed by several months. The paper also said Audi was locked in price negotiations with LG Chem, the South-Korean supplier of batteries for its electric vehicles, which wants to increase prices by about 10 percent because of high demand. LG Chem supplies electric vehicle batteries for Audi, its parent Volkswagen and Daimler. An LG Chem official declined to comment on the report, citing the confidentiality of its relationship with a client. The Audi spokesman also declined to comment on price negotiations with LG Chem.